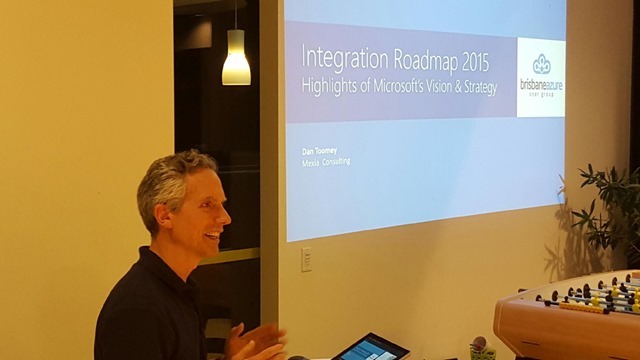 Last night at our Brisbane Azure User Group meetup, I had the privilege of delivering a short presentation on the Microsoft Integration Roadmap that was revealed on Christmas Eve last year, and which I previously blogged about. I couldn’t find any “official” slide deck from Microsoft yet, so I put together a rough deck of my own incorporating some screenshots from the roadmap PDF, a few slides from previous Microsoft decks, and a couple of handmade ones of my own. Feel free to download this from SlideShare and use it if you like. My presentation was preceded by an excellent session on Azure Application Insights given by Microsoft Solution Architect Todd Whitehead. Amazing to see how easy it is to get so much telemetry from Azure! Looking forward to using this feature more & more. More photos and details of the Meetup can be found here.